We all have heard about the Pareto principle in life but rarely we know anything about the originantor that how he has arrived at this principle. 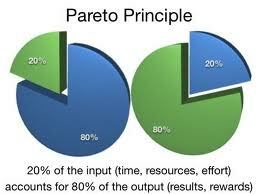 To cut it short and to let the cat of the bag the originator of the Pareto Principle was Vilfredo Pareto who was an Italian economist, engineer, sociologist, and philosopher. In fact, it was Pareto's observation in early 20th century Italy that has had a lasting impact on modern-day economics. 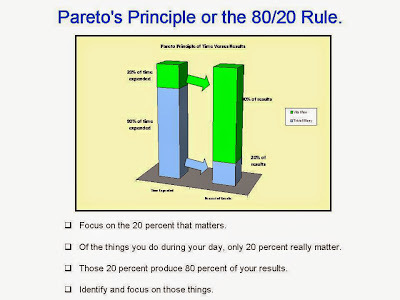 It's known simply as the 80/20 rule, or in academic jargon we call it as Pareto's Law. The origin of this law dates back to the year 1906 when Pareto discovered that 80% of Italian land was owned by only 20% of the population. Much like the golden ratio, he began to see this 80/20 ratio throughout nature and everyday life. While working in his garden, he observed that 20% of the peapods in his garden yielded 80% of the peas that were harvested for the year. Ever since, the 80/20 rule has been applied to everything from farming to business to investing returns and academics. This same principle gets applied to stock market intraday trading or the investment as 20% of your trades yield 80% of the profit and balance 80% trades just yield 20% profit. This principle has been applied to companies like Toyota or Ford who get 80% of their annual revenue comes from the sales of 20% of its product line. Or the Baltimore Orioles: 80% of their +30 home runs for the year will come from 20% of their batting lineup. And so on and so forth... And the exact same principle applies to investing. Thus one has to make sure that one lets the profits run and capitalise on the stocks which are generating profit and get out of the dud stocks. This is the reason we believe in trading for only 2 hours in a day and we close our all trades by 11:30 AM with profit and ourJackpot Tip is the best tip which generates maximum profit in the intraday trading.